The issues of climate change have been in the headlines for years now. Even though a few global warming skeptics can still be heard, most people now agree that climate change and global warming are the most crucial challenges to be met by the international community in the forthcoming decades. What is at stake here is the sheer survival of mankind – rising sea levels, warmer oceans, a greater number of extreme climate phenomena, more severe draughts and more frequent floods are but a few of the direct consequences of climate change according to the IPPC Fifth Assessment Report (AR5). Even more worrying, these changes will have a disastrous effect on all human activities, in particular those related to agriculture. It cannot be said that the world is paying no attention to the warnings issued by IPPC, the UN or other international organizations. 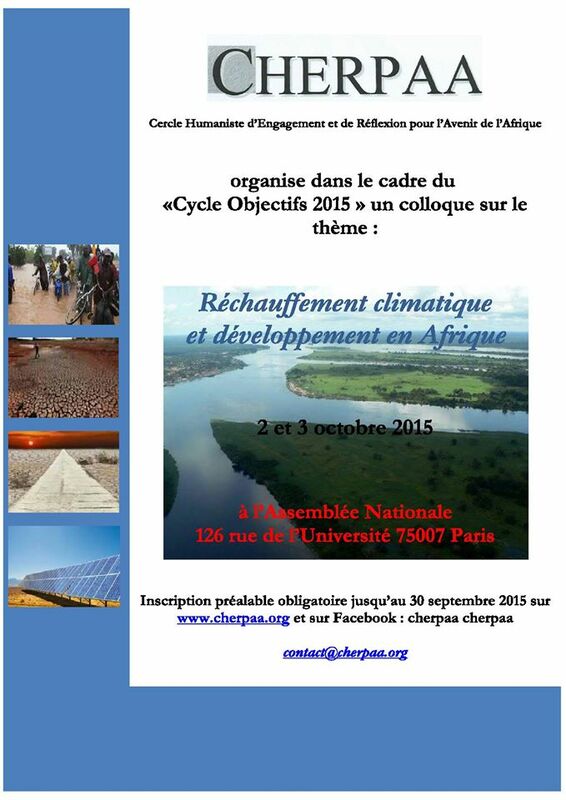 The topic of climate change will be on the agenda of AU’s 25th summit in South Africa in June 2015. The UN summit to adopt the post-2015 agenda will happen in New York City in September 2015 and should include potential avenues to fight global warming. The South African International Renewable Energy Conference (SAIREC) will take place in October 2015. The G7 and G20 meetings of June and November 2015 will also tackle this topic. In December, the Paris Climate Change Conference (COP 21) will be the climax of this year’s heightened awareness of the urgent need to act. In that context, why should CHERPAA organize another event? CHERPAA is aware that a great number of events is no guarantee of a better implementation of measures. However, we believe that we have a contribution to make to that debate. 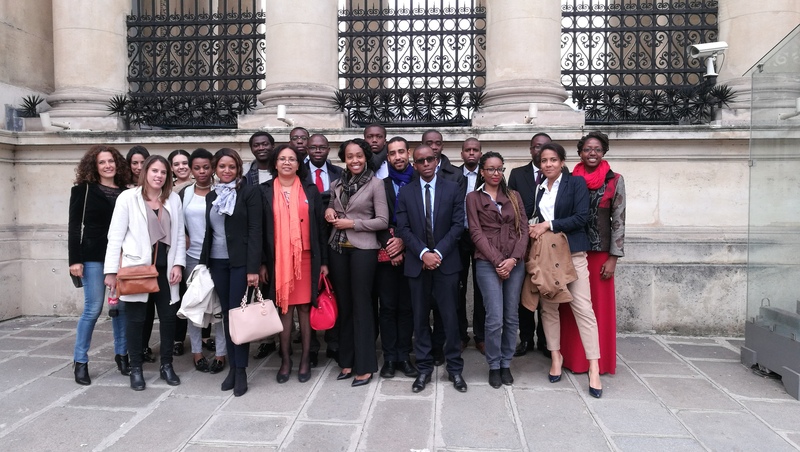 As a think-tank based in France, but bringing together Africans living in Africa, members of the diaspora and people from other continents but devoted to the development of Africa, we shed a different light on the way the challenges of climate change can be met by Africans. Africa today contributes for only 2.3% of CO2 emissions, when China alone accounts for 25%, the United States for 16% and the European Union for 12%. And yet Africa is the main victim of climate change. Its impact on crops, water resources or air pollution has tragic consequences for the population. Therefore we feel that Africans have a duty to think about the ways development may be achieved for the greater number, with respect and care for the earth. Those of us who are members of the diaspora see ourselves as links in a chain that stretches out from Africa to the rest of the world. Similarly, we should consider ourselves as links in a chain that originates in the remote past and continues well after us, in the centuries to come. That is why we have the moral duty to fight against the forces that are threatening the place where we or our families have come from. 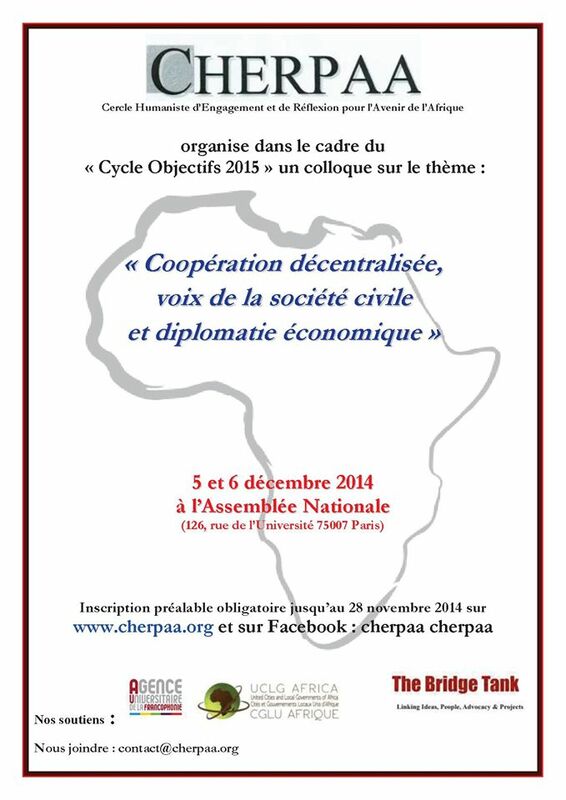 CHERPAA has already organized several conferences, dealing with the main agents of development – States, local authorities and non-governmental organizations. Each time, we have striven to bring together agents from different fields, whose experience might feed actions for the forthcoming years. Each time, we have come up with conclusions that were truly original. The same process is under way this time – we want people who have a direct knowledge of climate change to come and tell us about what can be done. Too often, international conferences are places for so-called experts to come and parade about their visions of a problem. Too often, their conclusions come to naught, for lack of a follow up or because they are too ambitious to be truly implementable. On the opposite, we want the findings of our conference to be workable. We believe that not everything has been said about how to meet the challenges of climate change. We also think that civil society should have a say in the decisions that are put forward. This is why we hope to welcome as many people as possible in Paris in October 2015. Why a meeting in Paris? By the end of the year, all eyes will be focused on Paris, as the Paris Climate Change Conference (COP 21) looms near. France remains a key-player in Africa, for better or for worse. French is still a widely spoken language in the world thanks to the members of the African diaspora. CHERPAA was born in Paris. For all these reasons, it makes sense to host such a conference about climate change and development in Africa in Paris. 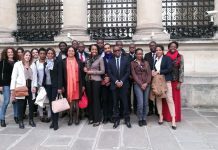 Many friends of Africa, many diaspora members live here and we think it will be easier to reach out to them from Paris. 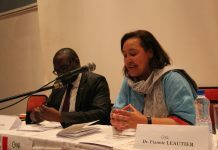 Furthermore, as would-be host of COP 21, France will have to pay even more attention to the findings of an event that has been conceived as a stepping stone to sustainable development in Africa. France is a permanent member of the UN Security Council and her voice is still heard in the world. If French officials listen to what Africans and Africa’s friends have to say, our meeting is more likely to bear a strong influence on Africa’s short- and middle-term destiny. Why should civil society be involved? CHERPAA believes in public policy. We remain confident in the capacity of states, governments and local authorities to play their part and help their people’s well-being. Yet civil society also has a role in the process that leads to decision-making and implementation. In matters such as pollution, energy and eco-friendly development, the voices of local people have to be heard. The distance from which larger structures such as states and international organizations see problems is necessary at their level, but misses many smaller points that matter in the end. CHERPAA is interested in these smaller points, because they can be addressed and solved in an easier way. Civil society is both a witness and an agent of change. Apart from the locals, who would believe that about 300,000 children under five die because of air pollution due to solid biomass consumption for cooking in their households? The struggle to switch to clean cooking facilities is a major cause, that only Africans can identify. Why should the diaspora take part and be addressed specifically? Africans living in Africa are the best experts on their own living conditions. However, failing to address and involve the diaspora would be a mistake. CHERPAA believes the diaspora in a key player on issues dealing with sustainable development and the fight against climate change. First members of the diaspora are citizens, sometimes both in their home and in their host countries. As such they are political agents that have a power over the people who manage public policies, be they implemented at a local or at a national level. Beyond the borders of their countries, they can also influence the decision-makers when they sit at the negotiating table of international organizations. Their awareness is thus crucial to ensure that the right decisions will be taken for the well-being of the greater number. Furthermore, they very often are economic agents, who represent a funding pool whose contribution to reforms might be decisive. How will the conference be organized? What topics will be tackled? The conference will be held over two days. Each day will begin with a plenary conference that will pave the way for more specific approaches addressed in roundtables. On the first day, issues related to the tensions between economic growth and global warming will be tackled. 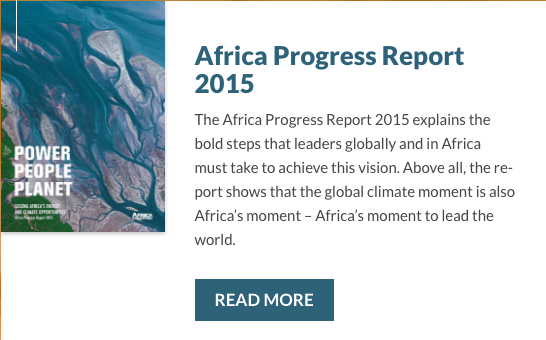 The opening plenary conference will ask the question of Africa’s real weight in the fight against global warming. Then we will think over the potential role of pan-Africanism in the struggle against climate change (Roundtable 1) – can Africans transform this threat into an opportunity that will make them stronger as a Continent? Later on that day, we will examine the means that are at Africa’s disposal to limit greenhouse gas emissions effectively (Roundtable 2). 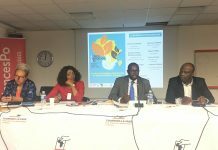 Discussing the means of action will lead us to scrutinize Africa’s efforts to fund research to find her own answers to problems (Roundtable 3) – is research conceived as a Continental asset, and what should be done to structure it at a Continental level? A closing conference will have us think about the ways to welcome and make the most of eco-friendly investment in Africa. The second day will open with a plenary that will discuss the tensions between Africa’s considerable resources in fossil energies and her ability to convert to green growth. 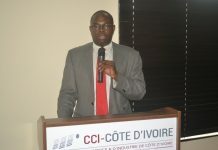 We will then turn to the question of agribusiness as a key opportunity for the private sector in Africa (Roundtable 1). As a logical sequel we will focus on agriculture and fishing as examples of what should be done to protect Africa’s potential for innovation (Roundtable 2). Another moment will be dedicated to the question of industrial alliances between Africa and Europe on issues such as urban growth or water management (Roundtable 3). A final roundtable will concentrate on social security as a tool for regional integration and the protection of vulnerable people, such as women and children – now that global warming is a reality, its impact on people’s health must become a priority for all, and must be addressed by organizations devoted to healthcare (Roundtable 4). Finally, a closing conference will call for the setting up of an Afro-European people’s bank (or fund) whose money should finance health, public research and environment.